2010, fitness and the 3six5. Not to toot my own horn or anything, but my year 2010 is off to a pretty excellent start. 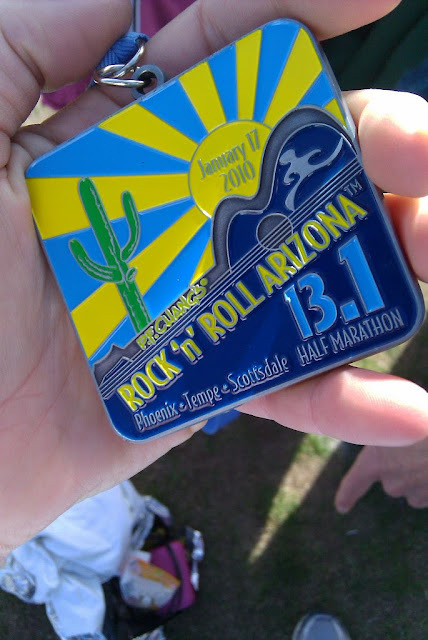 On January 17th, I competed in the Rock 'N' Roll Arizona half-marathon with my friends Jenn and George. Not my first running competition, but the first of any kind of substantial distance (after passing the 5k mark), with substantial training required. I have struggled with Celiac disease since I was a toddler. Certainly nothing to cry about, but it's a tricky affliction that left me malnourished and without energy or endurance for the majority of my life. Now that I have it under control, it has been pretty remarkable to see that I am able to train and build endurance if I choose to, albeit very slowly. I had always written myself off as no kind of athlete, and I am proud to be able to shed that self-imposed label. I completed the half-marathon (yay!) without stopping to walk (double yay!) and about 15 minutes faster than I thought I could run (w00t!). And, I learned that I really enjoy distance running. I'm contemplating giving a full marathon a shot, but need to confer with my right knee first. In the meantime, I am pretty pleased with this, what I consider to be a life accomplishment. So, that's pretty cool. On the docket for 2010 is my first triathlon, Chicago's competition on the 29th of August. I'm fairly certain that I have the chops for a sprint, which is where I'm registered currently. Trying to determine whether I have it in me to upgrade to the Olympic event. I've always thought of triathletes as kind of super-human, so I am looking forward to living up to that label, at least in my own head. And again, to do something that five years ago, I never would have dreamed I could do. I've got the gear, and I'm ready to train. 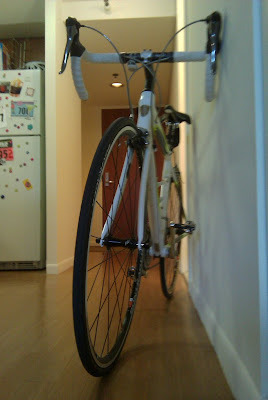 I'm planning on writing about the Chicago Triathlon experience in my friend Len's pet project, the 3six5. I'm pretty thrilled to be part of this experiment, described as "a crowdsourced journal of 2010." 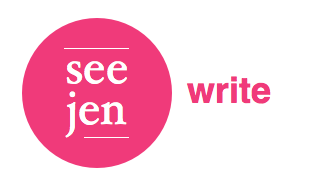 I like to think of it as a time-capsule of the blogosphere in 2010. There are an overwhelming collection of brilliant names on the list of authors, and I am humbled to be among them. There are still some dates left in the fourth quarter for those of you hoping to jump on this train. I'm really excited to see what becomes of this project. Follow the blog and twitterfeed for more information. And of course, tune in on August 29th for my triathlon recap. This post was rather me-centric, and for that I apologize. I hope you found it interesting anyway, and perhaps now feel like going for a run/bike/swim. 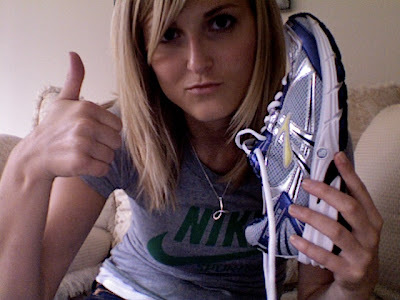 Fitness in 2010! America! On culture, perception, and lotion. 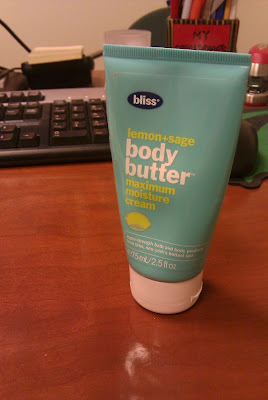 When it comes to lotion, this stuff is the best. It's getting my poor cracked, dry little paws through this horrid Chicago winter, buttery soft and smooth. Bliss Body Butter, available online and at W Hotels. For reals, it's so wonderful. And, not a client. I've always thought that the best, most luxurious lotion is the thickest and richest. It's chemistry, right? My dad was head of R&D at a prominent global personal care manufacturer, with the majority of their distribution in Asia and the Americas. The personal care category refers to hair, makeup and skin care, which stood for Most Excellent Profession Ever, to a pre-teen little lady. He was always bringing home goodies for me to sample, pretty much the ideal set-up (this probably explains a lot). Needless to say, I was pretty bummed when he eventually took a job elsewhere. On this particular day, I had put in a special request for some really good lotion; it was deep in the depths of a Michigan winter, and my hands were starting to crack and bleed. My dad, wonderful man, brought me home a plethora of lotions from a trade show he'd just attended in Tokyo. I thanked him, but ran back to Dad with complaints when I went to soothe my hands and discovered that the lotion was the consistency of milk. My brilliant father explained to me that in Asian cultures, the most luxurious lotions are the lightest and milkiest, based on how Asian skin reacts to skin care products. He went on to explain that the emollient, or moisturizing agent in the thick American lotion was the same as it was in this milky version. It was only the thickening agent that had been tweaked. To the chemist, a purely aesthetic and marketing-based adjustment, this. But to the consumer, a vital one, as the feel of the product is seen as the most important quality of a lotion. I didn't understand, at such a tender age, that this was advertising. But I do remember that it blew my *N'Sync-lovin' mind to think that there were people out there changing the chemical makeup of products not to alter the product, but to meet the needs of a culture. I remember the feeling of being truly and utterly fascinated by this thought. People are fascinating. I feel very blessed to work in an industry where I get to search for and explore cultural fascinations all the live-long day. Thanks, Pops, for your assistance in finding a passion. And, thanks for all the lotion. Every day, I walk to and from my apartment building through Lakeshore East Park. Quite rote activity, just another element in my daily routine. Since the park is on a lower street level than my building (I'm on the upper Wacker/Randolph level), I take the staircases on the western and eastern perimeters to cut through. The park is really quite pretty, but the staircases are pretty standard. 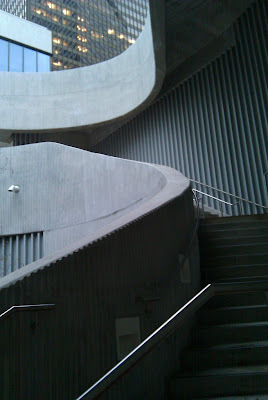 I was walking with a friend this weekend who suggested checking out the stairs in the northwest corner of the park, to which I had never given a second glance, behind a blocky concrete facade. So, I switched out of autopilot and we gave it a shot. 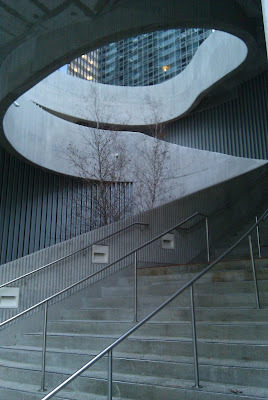 Beauty and shadow and light and weight and air and architecture and staircase-y awesomeness. I need to lie down. Moral: Routines are average. Break 'em; try something new. Alternate moral: Always give the stairs in the northwest corner a go. 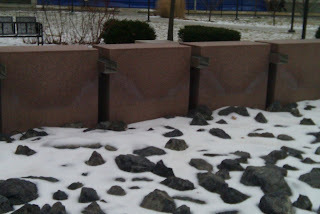 On my walk to work this morning, I noticed the pattern in the deposits on these fountains in Lakeshore East Park, by my apartment. The water deposits minerals in uniform isosceles triangles. Something about the surface tension of the water droplets, and the force behind the water as it is ejected from the spigot - planned, not random. Science. Weird/awesome, no? Almost makes me wish I had been a physics major, instead of good ol' advertising. But, not quite.